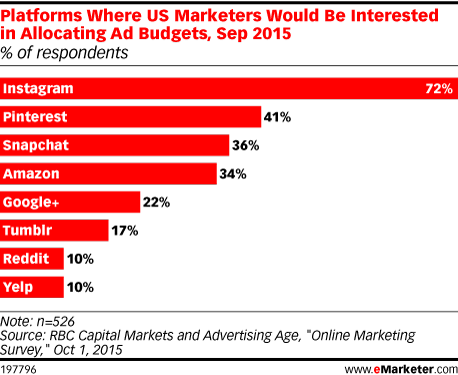 Data is from the October 2015 RBC Capital Markets and Advertising Age "Online Marketing Survey." 1,088 US marketers were surveyed in September 2015. Respondents identified their role as marketer or client (22.2%), agency professional (28.5%), marketing consultant (10.9%), media company professional (17%), marketing-services company professional (6.9%), student, educator or university employee (5.8%) and other (8.6). Respondents identified their company's revenues as under $5 million (25.6%), between $5 million and $9 million (8.7%), between $10 million and $99 million (17.5%), between $100 million and $1 billion (6%), more than $1 billion (12.7%), prefer not to disclose (13.4%) and don't know (8.3%). Respondents identified their marketing budget as under $500,000 (30.3%), between $500,000 and $1 million (13.3%), between $1 million and $5 million (10.9%) between $5 million and $10 million (4%), between $10 million and $50 million (5.7%), between $50 million and $100 million (2.7%), more than $100 million (4.1%), not sure (18.3%) and cannot disclose (13.7%).